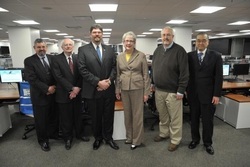 Federal Emergency Management Agency (FEMA) Administrator Craig Fugate, KK4INZ, met with ARRL leadership at FEMA Headquarters in Washington, DC last month. Fugate, an ARRL member, spoke with ARRL President Kay Craigie, N3KN, and ARRL Chief Executive Officer David Sumner, K1ZZ, as well as ARRL General Counsel Chris Imlay, W3KD, and ARRL Emergency Preparedness Manager Mike Corey, KI1U, about Amateur Radio's role in public service and disaster communications. Fugate wrote on his blog about the meeting: "For those of you that are not familiar with Amateur Radio, or ham radio as it is sometimes referred, it is the use of certain radio frequencies as a hobby, to exchange non-commercial messages, as a tool for education and experimentation and for public service community activities, including assisting in emergency communications. As a radio amateur, I enjoyed talking with [the ARRL] about the contributions that hams can make in times of disaster 'when all else fails.'" Fugate also mentioned that he was looking forward to ARRL Field Day in June, "where I will test my own field gear. It is a great event to encourage first responders and citizens to think about how to prepare for disasters and how to develop a plan for themselves and their communities. And perhaps it will inspire more to consider this great hobby that also has a long and legendary history of public service to the nation. We're grateful to our friends at the ARRL and look forward to partnering with them in exercises and efforts to plan, prepare, respond and recover from future events that we may face." In May 2011, Fugate spoke at an earthquake communications preparedness forum hosted by the FCC where he described the Amateur Radio operator as "the ultimate backup, the originators of what we call social media." In his remarks, Fugate praised Amateur Radio: "During the initial communications out of Haiti [during the January 2010 earthquake], volunteers using assigned frequencies that they are allocated, their own equipment, their own money, nobody pays them, were the first ones oftentimes getting word out in the critical first hours and first days as the rest of the systems came back up. I think that there is a tendency because we have done so much to build infrastructure and resiliency in all our other systems, we have tended to dismiss that role 'When Everything Else Fails.' Amateur Radio oftentimes is our last line of defense." At the forum, Fugate said that he thinks "we get so sophisticated and we have gotten so used to the reliability and resilience in our wireless and wired and our broadcast industry and all of our public safety communications, that we can never fathom that they'll fail. They do. They have. They will. I think a strong Amateur Radio community [needs to be] plugged into these plans. Yes, most of the time they're going be bored, because a lot of the time, there's not a lot they're going to be doing that other people aren't doing with Twitter and Facebook and everything else. But when you need Amateur Radio, you really need them." On March 27, the FCC released a First Report and Order, Further Notice of Proposed Rulemaking and a Notice of Inquiry (ET Docket Nos. 13-84 and 03-137). 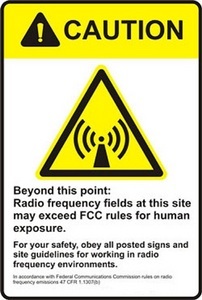 The documents seek to reassess the FCC's RF exposure limits and policies, as well as to propose changes to the FCC's rules regarding human exposure to RF electromagnetic fields. These proposed changes would affect the Amateur Radio Service (Part 97) rules. In its Notice of Inquiry, the FCC included clarifications related to the application of occupational exposure limits for devices and at fixed transmitter sites. The FCC noted that it "should be helpful to licensees to codify our earlier adopted policy with regard the use of occupational/controlled limits at Amateur Radio stations." This policy was first established in the RF Report and Order of 1996, but it was not incorporated in the rules at that time. It allows amateur stations to be evaluated "with respect to occupational/controlled exposure limits, as long as appropriate training and information has been provided to the amateur licensee and members of his or her immediate household. Other nearby persons who are not members of the amateur licensee's household must be evaluated with respect to the general population/uncontrolled exposure limits." "The ARRL has an RF Safety Committee, consisting of experts in the field," explained ARRL Chief Executive Officer David Sumner, K1ZZ; "The committee members, as well as Board members and staff are reviewing the lengthy document and will formulate a response." Read more. This year marks the 88th anniversary of the founding of the International Amateur Radio Union (IARU). To mark this occasion, the IARU and its more than 160 Member Societies will celebrate World Amateur Radio Day on April 18. For many years, the IARU Administrative Council has declared a theme for each World Amateur Radio Day. The theme for 2013 is Amateur Radio: Entering Its Second Century of Disaster Communications. The theme commemorates the first known use of Amateur Radio in a disaster situation: Herbert V. Akerberg -- a 15-year-old from Hilltop, Ohio -- is believed to be the first person to use Amateur Radio to call for help during a disaster. In late March 1913, the Scioto River in downtown Columbus, Ohio flooded its banks, killing more than 100 people. According to a November 2012 article in The Columbus Dispatch, Akerberg used his home radio transmitter to send SOS calls via Morse code for nearly 72 hours. Read more. The WRTC 2014 Organizing Committee will be conducting a capability and training test for the World Radiosport Team Championship stations and volunteers during the 2013 running of the IARU HF Championship, July 13-14. According to WRTC 2014 Co-Chairman Randy Thompson, K5ZD, the organizing committee is looking for local hams and volunteers willing to visit New England during the contest to assist with station setup and operation; preference will be given to those volunteers who intend to return and assist with the 2014 event. Thompson said the committee is looking to set up and operate up to 30 stations during for the final station test before the WRTC 2014 competition in July 2014. Read more. This feature is a concise monthly update of some of the things that the ARRL is doing on behalf of its members. This installment -- which covers the month of March -- takes a look at the FCC's decision to grant the ARRL's waiver request for TDMA operation, the 2013 sessions of the ARRL Teachers Institute on Wireless Technology, the ARRL's Second Century Campaign, new League publications, updates from the ARRL Development Office, reports from the Official Observer Desk and more. Read more. ARRL Field Day, Amateur Radio's largest on-the-air operating event is June 22-23 -- just a little more than two months away -- so be sure to get your official 2013 Field Day gear before supplies run out. 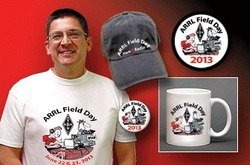 For 2013, the ARRL is offering a white t-shirt, pin, hat, ceramic mug, patch and logbook for Field Day. Be sure to get yours before supplies run out! This year's ARRL Field Day shirt is a white t-shirt that sports the 2013 Field Day logo on the front, with the ARRL diamond logo and "Ham Radio" on the back. Shirts are available in sizes Small-4XL. The charcoal gray hat -- with the words "ARRL Field Day" and "Ham Radio" embroidered on the front -- has a loop-and-hook closure, ensuring a proper fit. The round pin, with its easy-to-secure post fastener, sports the 2013 Field Day logo. A coffee mug and a patch are new for 2013: The white 11 ounce mug features the 2013 ARRL Field Day logo, while the 3-inch silk-screened patch is perfect for sewing onto a jacket or sweatshirt. The ARRL Field Day Logbook is set up in the Field Day reporting format and includes dupe sheets and other forms that you need to ensure a successful Field Day. Clubs, order early! Collect orders from members and place a single order -- pay only $12.50 shipping for orders over $50 (while supplies last). Fulfill all your Field Day apparel needs at the Field Day Supplies section of the ARRL website. The Sun, as seen on Thursday, April 4, 2013 from NASA's SOHO Extreme Ultraviolet Imaging Telescope. This MDI (Michelson Doppler Imager) image was taken in the continuum near the Ni I 6768 Angstrom line. The most prominent features are the sunspots. This is very much how the Sun looks in the visible range of the spectrum. 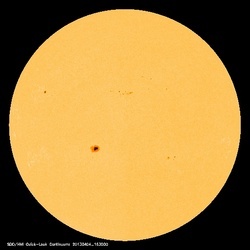 Tad Cook, K7RA, reports: Solar activity increased over this past week, with the average daily sunspot numbers up 32 points to 81.6, while the average daily solar flux increased more than 16 points to 113.4. The geomagnetic field was active on March 29 due to solar wind. The predicted solar flux is 130 on April 4-8, 125 on April 9, 115 on April 10-11, 125 on April 12, 120 on April 13-14, 115 on April 15, 110 on April 16-17, 105 on April 18-19, and back down to 100 on April 20-21. The predicted planetary A index is 5 on April 4-5, 8 on April 6, 5 on April 7-22, then 12, 8, 18 and 15 on April 23-26, 5 on April 27-29, and rising to 8 for April 30-May 4. Look for more information on the ARRL website on Friday, April 5. For more information concerning radio propagation, visit the ARRL Technical Information Service Propagation page. The winner of the March QST Cover Plaque Award is Carl Luetzelschwab, K9LA for his article "The Sun and the Ionosphere." Congratulations Carl! 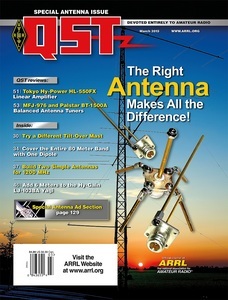 The QST Cover Plaque Award -- given to the author or authors of the best article in each issue -- is determined by a vote of ARRL members on the QST Cover Plaque Poll web page. Cast a ballot for your favorite article in the April issue today. J. Kenneth Pulfer, VE3PU, of Ottawa, Ontario, passed away Sunday, March 31 after a short illness. He was 80. In 1994, Pulfer became the Secretary, then Secretary Treasurer for the Radio Amateurs of Canada (RAC), that country's IARU Member Society. He also served as the RAC's Vice President for Government Affairs and Vice President for International Affairs. 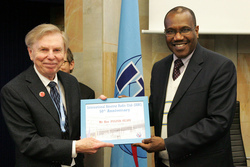 When former ARRL Chief Technology Officer Paul Rinaldo, W4RI, retired in 2009, Pulfer took over as Chairman of the ITU Radiocommunication Sector's Working Party 5A Working Group 1, the "home" of the Amateur and Amateur-Satellite Services in the ITU structure. He served as an IARU Technical Representative for 15 years, culminating with the 2012 World Radiocommunication Conference (WRC-12). Read more.